An electric bicycle is a bicycle that uses electricity as its power. These bikes do not pollute the air. Usually a biker can control how much the motor helps. For example, it can be 50% of the force needed. These kinds of bikes have become more popular. 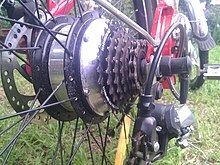 In some cases it is possible to convert a traditional bike to electric using a conversion kit. This page was last changed on 27 March 2015, at 19:55.